Ask.fm is an anonymous question and answer platform website used regularly by lots of young people in Ireland and around the world. It allows anyone to post anonymous comments and questions to a person’s profile and is increasingly being used as a means to communicate abusive, bullying and sexualised content. Here, Webwise gives you Ask.fm: A Guide for Parents and Teachers, detailing how young people sign-up and use the site. On visiting the site, Ask.fm encourages people to sign-up to begin receiving questions and posting answers. After clicking on sign up, a page – like the one to your right – appears where the website asks people for a username, full name, email address and password. 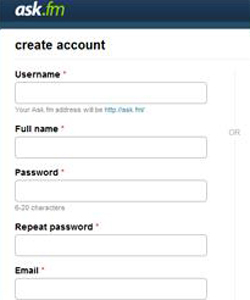 Ask.fm also gives potential users the option of signing in using their Facebook or Twitter credentials (More on the interaction between these social networks below). After giving these details, users are then given the option of filling out more personal information such as date of birth, gender, location and a bio – or short personal statement. At this point, pictures of the user can also be added. Once through this process, Ask.fm encourages people to share their profile through various different social networking websites like Facebook, Twitter and Tumblr. When the link is shared on the web, people can find a profile to begin posting anonymous comments/questions to your page. On signing up, users are also given the option of searching for people they know already using Ask.fm by entering names, usernames or emails etc to find friends. Ask.fm operates a similar friend system to Twitter: users can choose to “follow” other users. However, unlike Twitter, a user can never find out who is following them and can only know the overall number of followers he/she has. By following a person, it allows a user to view questions and answers posted on other people’s profiles. These notifications appear in the “home” section of a user’s profile, which is more or less the same as a person’s Twitter feed or Facebook timeline – a place where all your friend’s updates are aggregated for you to see. There is also a “stream” section of the site for users. This is where a user can see various different questions and answers being posted at any given moment across the Ask.fm community. There are daily questions for users to answer too, such as “what sport do you do?”, “which song reminds you of your childhood?” and “which websites do you visit most frequently?”. 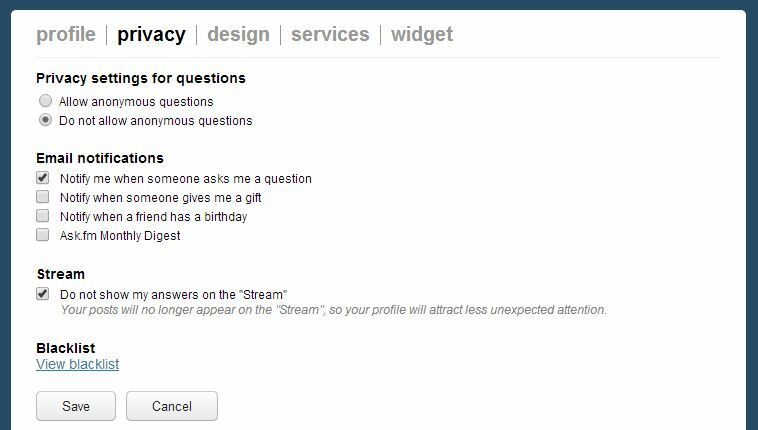 There is also a “random question” option where Ask.fm will post a question to your stream for you to answer at random. As well as this, there is a “popular” tab where it appears that popular user profiles are advertised to other users. 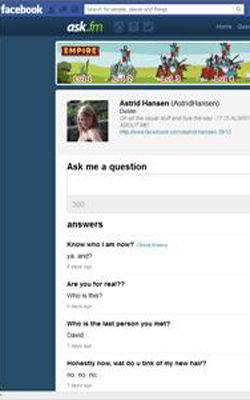 At the top of the Ask.fm interface are a number of different tabs, each one linking to various parts of a person’s Ask.fm identity. The “questions” tab links to all questions available to answer at any given moment to a user, including personal questions directed at them by other users and more general questions being asked on the day. The profile and home tabs link to a person’s home page/profile, and the friends tab links to a page which displays all the people a user is following. “Search” will allow users to insert search terms to find friends and other people active on the site, and settings is where a user can amend privacy and other controls such as appearance and contact details on their Ask.fm profile. By clicking on settings and following the privacy tab, users can set a range of different settings for their profile. On the privacy tab, Ask.fm gives its user the option of blocking anonymous postings and removing their posts from the “stream”. A blacklist, a listing of all users blocked by you, is also maintained on this page and there are various other options regarding things like the Ask.fm monthly email update and notifications of a friend’s birthday. 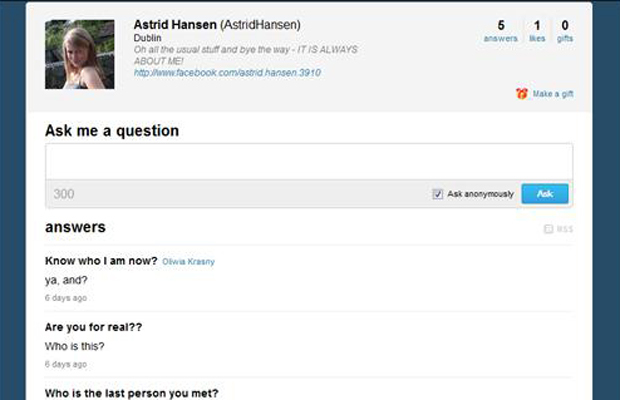 The above picture is how a profile will look on Ask.fm. As you can see, the main feature on any profile is the question box, where anyone – user or non-user – can post a question or comment directed to an individual. A person can either ask a question anonymously or can reveal their identity by clicking to opt out of the anonymous function beside the “ask” button. All questions asked and answered are displayed on a user’s profile below the question box. A user can ask any other user a question even if they do not follow them. Ask.fm offers users the chance to “ask friends a question”. When this tab – which is located on a person’s home page – is clicked, a box appears in the browser. 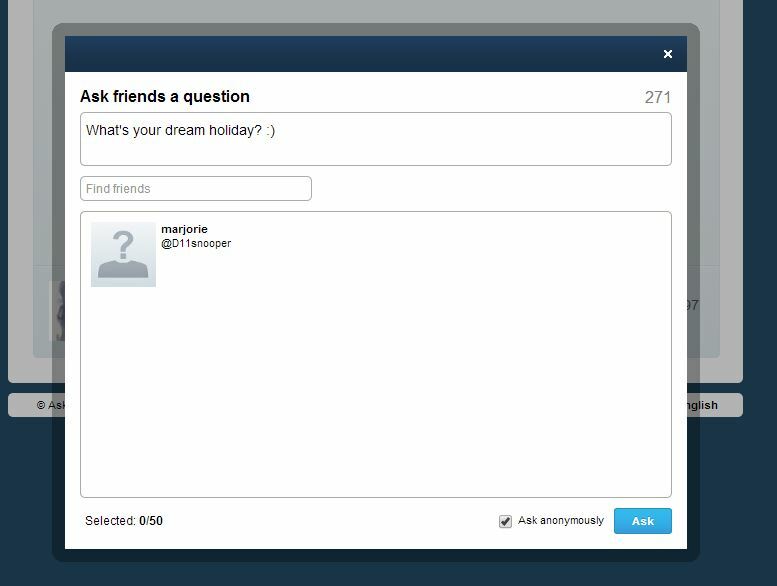 Here, a user can ask any of their friends – people they follow – a question anonymously or openly by typing in the content, clicking on the profile and clicking “ask”. This then appears in the other user’s notification tab – the question mark which is located at the top of the page beside the Ask.fm logo. The question can then be answered by the other person, who has the option of sharing their answer on Facebook or Twitter, depending on how they have signed in. Users who receive questions can also decline to answer them. This means that they will not appear on your profile, Facebook or Twitter page – a question must be answered before it becomes public. Once a user locates a profile, they can ask anyone a question by filling in the question box and click on “ask”. Ask.fm is highly integrated with Facebook: when attempting to sign-up to Ask.fm, users are given the option of signing in via Facebook. This makes singing up even easier for young people, but it also means that they have the option of cross-posting the questions they receive and the answers they give to their Facebook timelines. If the questions and answers are cross-posted, they appear to everyone on Facebook, depending of course on the Facebook privacy settings. 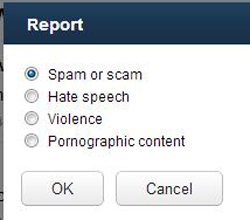 This means that even abusive, sexualised and bullying content can find its way onto Facebook. This immediately increases the connectivity of Ask.fm, as users no longer have to build contacts through the Ask.fm interface. Instead, they are already connected with their Facebook friends and can begin receiving questions straight away. There is also another link that Facebook has with Ask.fm: The Facebook Ask.fm app. Entering a search for “Ask.fm” on Facebook brings users into contact with the Ask.fm application. When clicked, users are told that the Ask.fm app will “post on your behalf, including status updates, photos and more”, and “access your data anytime”. Users are also given the option of who will see their Ask.fm postings: public, friends, only me or custom settings. There are various other privacy settings too. The app means that users can operate their Ask.fm profiles within Facebook. As you can see, Ask.fm appears within a Facebook frame for users who chose to use the app. It has no significant impact on the Ask.fm user experience other than allow the site to use Facebook information that you have already posted. Posting answers to questions works in the same way as above and can appear on timelines. Users are also encourages by Ask.fm to post a link to their Ask.fm profile to their Facebook timeline in order to promote the opportunity to ask the person questions. 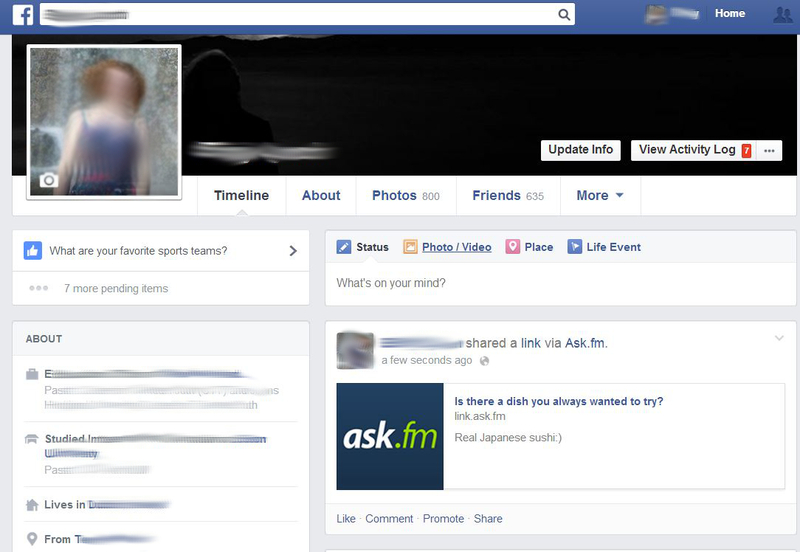 As with Facebook, Ask.fm is integrated with Twitter, but to a somewhat lesser extent. There is no Twitter/Ask.fm app, instead, users can only integrate with their Twitter accounts by opting for the option of signing in using their Twitter credentials. By doing this, users have the option of publicly tweeting the answers to questions they receive. Once done, the question and the answer appear on Twitter and can be viewed by anyone who does a search for “ask.fm” on Twitter or by someone using a live Twitter application which shows up-to-date tweets sorted by search terms, such as Tweetdeck. Again, this means that instead of growing a network of friends through the sites itself, Ask.fm users can link to their Twitter friends – and indeed through anyone who searches or uses Twitter – by singing into Twitter. If a user is unhappy with the content of some of the questions, they can block the user, even if they don’t know who they are. On the right hand side of each question is a small block symbol. Once clicked, the following screen pops up. Here, users can block the user but must give a reason. However, Ask.fm does warn users that even if they block someone, that person can still access the profile to view all other interactions. Once “block” is clicked, the user will no longer get questions or likes from that person. In privacy settings, under blacklist, a user can unblock the user.